Your Brain on Nature (start time: 5:49): You may think it’s a no-brainer: that nature is good for your mental and physical health. After all, a walk in the woods or even an urban park brightens your outlook on life, at least for a little while. Turns out, the notion that being outside in nature boosts our mood, and even our creativity, has historical roots at least as deep as Aristotle. A new book by journalist Florence Williams explores the history of our biophilia, and particularly emerging neuroscience that reveals just how our bodies and minds are affected by getting out in the natural world. 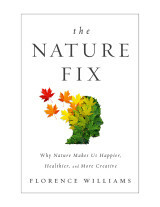 The book is called The Nature Fix: Why Nature Makes Us Happier, Healthier, and More Creative (Norton, 2017). The book stemmed from an article Williams wrote in National Geographic. A former Boulder resident, Williams will return to Boulder to give a talk about her book on Tuesday, February 28th, at the Boulder Book Store, at 7:30 p.m. She’ll also speak in Denver, on Wednesday, March 1st, at Tattered Cover Book Store, at 7:00 p.m.